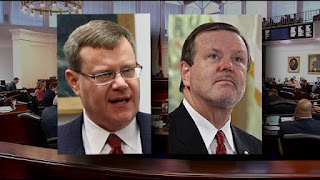 NC General Assembly adjourned and immediately reconvened for yet another special session, which is what the Republican bandits in charge of that place had planned all along. Unable to win a second term for McCrory, the General Assembly -- principally Phil Berger and Tim Moore, leading their respective houses of the GA -- are now proposing to overturn the results of the election by depriving our new governor of executive power. 1. Remove Medicaid from control of the governor, moving it under the new Treasurer, who is Republican. 2. Remove the office of human resources from the governor and give it to the lieutenant governor, who is Republican. 3. Remove control of the boards of elections -- all of them -- from the governor and give it to the lieutenant governor. 4. Reclassify approximately 1,000 state jobs from "political" (subject to appointment by the governor) to non-political. These were jobs that had been reclassified "political" for McCrory's benefit when he took office. 5. Give McCrory lifetime coverage under the state health-care plan. "4. Reclassify approximately 1,000 state jobs from "political" (subject to appointment by the governor) to non-political. These were jobs that had been reclassified "political" for McCrory's benefit when he took office." Oh you mean to return it to the way it was under Democrat governors. I want you to remember your standard for moral equivalency, Wolfshead. I want you to remember it down the road when Democrats take back power in this state. I will only cheer them for doing to Republicans what they've been doing to Democrats, and I know you will too. It's only fair, right? That's your point? So returning things to the way it was under democrats isn't right? If the repubs make a power grab the dems want to continue it? That's not moral equivalency, it's just statism by either party at the expense of the people. The problem with the democrats is they think they're better than republicans, and the problem with republicans is they think they're better than the democrats. They're just two sides of the same coin.